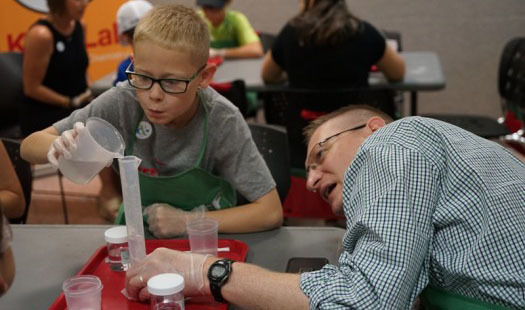 BASF KID’S LAB: CHEMISTRY IS BANANAS! What do you have in common with a banana? Put on your gloves and goggles in order to discover the answer to this question. You will be rewarded with a firsthand look at an amazing material that makes all life possible. Each participant will also receive a cool backpack with surprises inside! BASF Kids’ Lab requires adult participation and is offered on a first come, first served basis with registration beginning the morning of the program, and space is limited. Participants may preregister Monday through noon Thursday prior to the program by e-mailing kidslab@lasm.org; onsite registration is also available the day of the program on a first come, first served basis. Groups that schedule in advance may receive confirmed reservations and discounted admission rates.